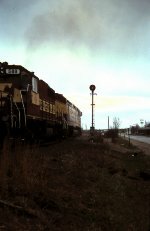 Description: An eastbound passes the ex-SOO 9th Ave. depot. Description: An eastbound freight heads east of town. Description: Coming down Byron Hill! Description: One of the SDL39's waits for it's next call. Description: A nice ex-MILW SDL39 leads WC local L-093. Title: 60% of the World's SDL39s. Description: Ten SDL39s were built for the Milwaukee Road between 1969 and 1972. In 2002 Wisconsin Central's nine survivors moved to Connersville Indiana before being sold to Chile. Six of them are shown here (588, 585, 592, 586, 590, 589) while a seventh (587) was being used on a train on the day of this visit in August 2002. Description: CN has removed the Harmony Co-op siding- must not have been enough traffic in and out. Description: Wye track for original WC main to the Twin Cities was still in at this time. Note track equipment on wye track at left.